The whole concept of 'clearing the decks' in a comic universe is a pretty bold step. You are placing a lot on testing the faith of fans. After all, if the 'clearing' involves their favourite character - well, there goes a reader, a punter, a paying customer, a fan. They may not come back. The Ultimate Marvel Universe has not so much been cleared as ransacked, raped and pillaged. I must admit to not really getting into the Ultimate titles in a big way, although I enjoyed the first 2 series of The Ultimates, and Ultimate Fantastic Four had a real charm and energy to it. I am sure that Ultimate Spider-Man did as well, based on the little I did read in trades. Ultimates 3, which was the genesis for much of what followed in Ultimatum, was not particularly good. That should have been a warning, as that was written by Jeph Loeb, as is Ultimatum, a 5 issue finale to the 'first chapter of the Ultimate Universe', that has now come to an end. I don't really go into the Superhero comics in a big way, but the Ultimates and Ultimate Fantastic Four was a reboot that touched on the Silver age of Marvel and I felt a connection to that. I loved reading the reprints of Fantastic Four and The Uncanny X-Men from Marvel UK in the early 1980s. Similarly, the Lee / Kirby Spider man tales were reprinted in the early 1980s by Marvel, and I loved them to. The Ultimates and Ultimate Fantastic Four gave me a similar satisfaction when I read them. But Ultimatum has made it all look ridiculous. Ultimatum is ridiculous for a few reasons (the dialogue, the pacing) but the main reason it is lamentable is the fact that characters that have been around for years all start falling over like a stack of dominoes. It makes no sense. There are so many Heroes killed that it feels perfunctory. Similarly, major Villains are struck off with ease. Ultimatum just seems to be there to push the envelope until it becomes a unique, but flawed exercise in graphic violence and the toll it takes on humans - super or mutant or otherwise. It is certainly a page turner, as you anticipate a death around every corner. It is a bit perverse, in that sometimes in the past I have thought it ridiculous that hardly any superheroes die in battle, to be complaining about a comic series that dares to kill heroes off without a second thought. But there are ways of doing it, to give a death the impact it should have, and also to treat a readership with a bit of respect, and allow them to experience the death of a character they follow with the necessary sensitivity. But hey, we are talking about comics here. Who cares? I don't think the creative team behind the Ultimatum storyline do - and that's the problem. If you were to read the Ultimatum series, you may be forgiven for thinking you are reading a comic written by someone who doesn't like comic book heroes, or their readership, all that much. I do not think that is the case, but sometimes it is hard to shake that feeling. It is difficult to sum up my feelings on Ultimatum. One thing that is nagging at the back of my mind is the fact that when the Ultimate Universe comes back - 'rebooted', if you like - then eventually some of those dead heroes are going to be finding their way back into continuity. So really, what was the point of Ultimatum? I think that does sum up how I feel about it all. Verdict. I think people will remember Ultimatum for a long time. For different reasons. I don't think you are likely to see this type of comic again in a long, long time. All of this may be a good thing or a bad thing. Depends on your point of view. The graphic glee with which established and loved characters were routinely dispatched is unique in comic history. For bloody mindedness, it gets 10 out of 10. Personally, I give this issue a 4 out of 10. I've heard, although I'm not sure if it's true, that Loeb prides himself on not reading the past issues of titles that he takes over, preferring not to be "constrained" by what the writers before him did. It certainly rings true, though, given his god awful handling of the Ultimates. 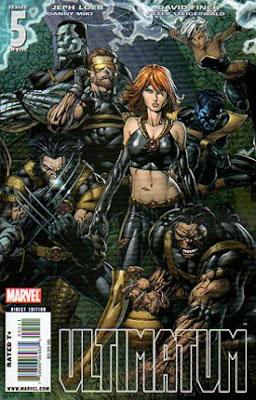 Both Loeb on Ultimates & Coleite on X-Men seemed to have never read anything in the Ultimate line, prefering to turn it into some hideous substandard pastiche of Marvel comics from the 90s. With Millar and Ellis both returning for the re-launch, here's hoping for another few years of solid storytelling, before Marvel throws it to the hacks again.